"Your name is really beautiful just same as you, Ageha." "Neo Tokyo Kool Ambient : The Binaural Dream". As it name suggests, this track has composed with tactics of binaural beat. A beating tone will be perceived, as if the two tones mixed naturally, out of the brain. then the Binaural beat would have a frequency of 10 cycles per second at 505Hz. and earnedgreater public awareness in the 1970s based on claims that binaural beats could help induce brainwave synchronizations. The research about them continued and it have been claimed to induce to the altered state of consciousness such as out-of-body experiences. Chaos in dazzle and arousal. We recommend this album especially for fans doped with such as "Ascension Spectacle" and "The Brain Tuner". "The album, Ageha, is filled with beautiful sounds as it called binaural beats. And the beats lead you to daydream that you've never had. It may lead to calm explosion in your blood run through your body, it may ignite your imagination run free. Or it may help you metamorphose into the one you've been desired. Put your headphones onto your ears, listen to "Ageha" and feel what will happen. but to all the butterflies who's waiting for the time will come. Time has come, feel it." 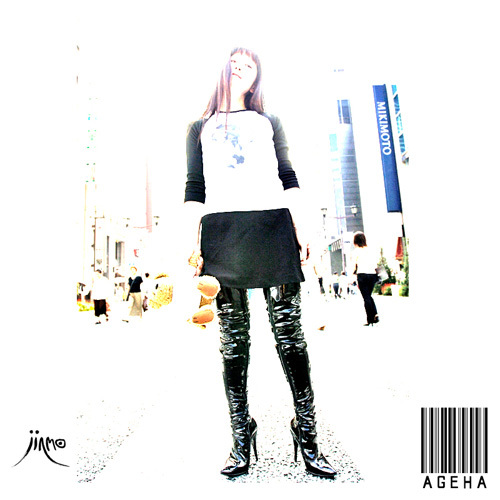 JINMO has dedicated "Ageha" to Ageha Avant-attaque, the one who is expressing Neo Tokyo Kool. JINMO composed this album upon cyber orchestration image of Chuang-tzu "The dream of a butterfly". The beautiful cover photograph taken by our friend GumGum and the cover model for "Ageha" is Ageha. Close your eyes, listen to the sound from left and right channels. Enjoy extra kool, cyberistic fantasia, dream of your own "the dream of a butterfly".